‘Imperial Regent’ and ‘Knights Templar’ Angelus Domini (Alan Douglas) was upset with the recent aired Episode on SkywatchTV News hosted by Derek Gilbert with Richard Shaw, Producer/Director of ‘Torah Codes: End to Darkness’ and Presenter Derek Gilbert. The Episode aired on the 8th March, 2016. I find that this rather rich considering that CJ Isaac is the voice of Lord RayEl, furthermore Clark Isaac removed all reference of Raymond Lear (Lord RayEL) from the Sanctuary Interfaith website in Jan 2016 which is registered in his name. Moreover, all videos made by The Ecumenical Order of Christ uploaded to You Tube have their comments disabled. Questions posed or posted in the Facebook International Congregation of Lord RayEL are screened or deleted if any individual show dissent. Several times we have asked the Ecumenical Order of Christ for an interview in respect of their claim that Raymond Elwood Howard Lear is the Returned Christ, Isa and Mosiach. All requests denied. If you skip to 8 minutes in the following video, Presenter Derek Gilbert makes an apology of sorts, which in itself is hilarious and rather to the point. I sent Mr Derek Gilbert a link to my blog on Purim and asked why he felt it necessary to apologise. “The apology was only an apology of sorts. I did confuse him with another false Messiah, after all. It doesn’t change the fact that he is a false Messiah, and that was my point. The apologist who sent me the email wanted me to give him time to prove that RayEl is the Messiah. That’s not going to happen” Derek Gilbert, SkywatchTV. Richard Ruff behaved true to form within the International Congregation of Lord RayEL as an ‘Alpha Male’ . He has fashioned a Torah code on producer/director of ‘Torah Codes: End to Darkness’ Richard Shaw in nothing more than a shocking, demeaning and bullying manner. This type of behaviour by Prime Cleric Richard Ruff is typical. He will often resort to these back-handed tactic when either he or his codes are being exposed. Not so long ago, a similar code was fabricated on Rabbi Glazerson. The reason for this attack is because of an earlier broadcast. In that episode producer/director of ‘Torah Codes: End to Darkness’ Richard Shaw highlighted Glazerson’s February 2016 Torah Code debunking what he deems to be a False Prophet named Lord RayEl and confirmed what the author has been saying about the blatant use Rabbi Glazerson’s codes to try to legitimise the authenticity of Raymond Elwood Howard Lear being the Returned Chris, Lord RayEl, Ra-el. “They have reworked the work of Rabbi Glazerson to prove that RayEL is really who he says he is, they did that in a round-about method, I don’t want to say that they were stretching the truth, but essentially they probably were. They actually even used a photo of Rabbi Glazerson on their own site and in their own publications as if Glazerson’s Torah Codes are proving that RayEL is who he says he is. Well, of course that did not make Rabbi Glazerson very happy at all. So he went and did a serious table on RayEL recently and sent it to me and it says Lord RayEL as that is what he calls himself, and attached to that at the bottom is the word liar, cheater and Amalekite” Richard Shaw, SkyWatchTv, Richard Shaw Torah Codes and UFO Cults. Cult leadership is feared. To disagree with leadership is the same as disagreeing with God. Cult leaders claim to have direct authority from God to control almost all aspects of their Congregations life. This behaviour is demonstrated by Richard Ruff. He uses the Torah to legitimise his stature. Its all pretty pathetic. On an upside though, the Rabbis are upset with the Ecumenical Order of Christ and their blatant lies are being exposed. At the time of writing this blog, Purim 2016 is on the doorstep, many Rabbincal scholars have highlighted that the MOSHIACH will be announced. One sure thing, is that Raymond Elwood Howard Lear (Lord RayEl Ra-el) is not the MOSHIACH, Isa or the Returned Christ. Nobody has seen him since 2011 and he is still wanted in America. It’s fair game to say, that he is one of many False Prophets. I have been following and appreciate your posts about rabbi Glazerson and our work together. And, I’m saddened about “Lord RayEl,” the self-proclaimed messiah originally from the U.S. It doesn’t take much due diligence to discover that this man appears to have had a very checkered past, and what is sad is that he has managed to convince people to follow him when he needs help himself. This is not a hit piece about RayEl (Raymond Elwood) or Richard Ruff. I will simply mention the truth of what has been happening so that there is no confusion. 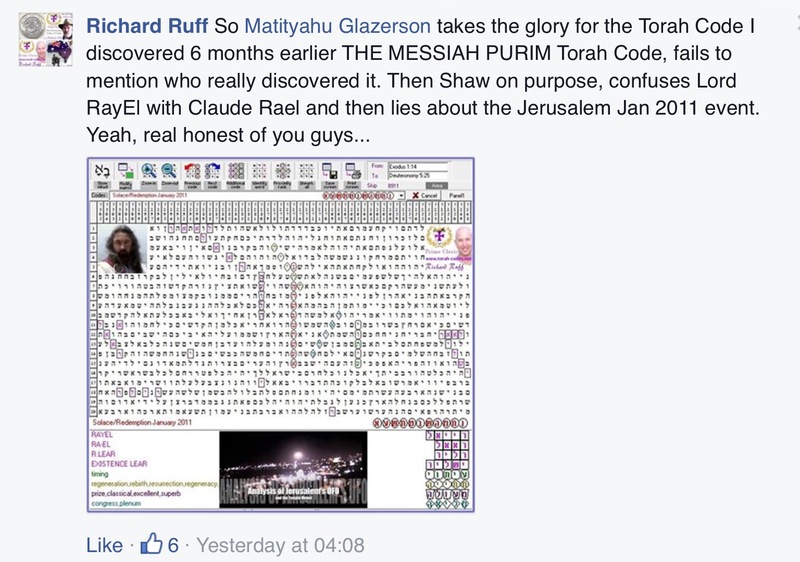 For years, Richard Ruff has been doing Bible Code tables about RayEl, using Glazerson’s picture (the original picture was one that I shot in New York at Prof. Haralick’s house) as if Glazerson had something to do with it. They also used a UFO sighting that went viral on YouTube, typically referred to as the “Jerusalem UFO” back in 2011, now old news, that was analyzed and proved fake by a video expert here in Hollywood. (For a technical evaluation of this sighting and why and how it was analyzed fake, it is in the video WATCHERS 2). There were something like 6 different versions of this UFO video, each one looking more and more fake. Version 3’s background image of Jerusalem at night was actually a commercially available stock photo, (complete with star filter effects) put up on a computer screen and shot with a camera, with the UFO composited (keyed) over it. Incredibly, version 3 is the one Fox News used to report the sighting even though it is based on a still image. These sightings is what RayEl seems to want to connect his “second coming” to Israel. Most of the other videos were taken on a cell phone, with the UFO composited over it in Post. How can we know this? Because the frame rates of the two layers don’t match. This really has nothing to do with Lord RayEl, but the original hoaxster putting up fake UFO videos on YouTube, of which there are already hundreds of them as well as hundreds of “real” ones. It takes careful analysis to know the difference. Rabbi Matityahu Glazerson has not made any attempt to confirm Lord RayEl as the Messiah and finally when they continued to post unwanted materials linking him to Lord RayEl, he did a new table, which I showed on Skywatch with Derek Gilbert. It was my hope to finally put to rest any connection with my friend Glazerson to Lord RayEl. To most of us, Torah Code tables exist only to prove the validity of the Torah text, that no other text can manage to produce codes about people and events in our age like the Torah can. It can be used for good or bad. To lift up, or to defraud, to show the truth, or make up nonsense — as can anything good be twisted into a bad thing. Dubious codes need to be run through prof. Haralick’s Monte Carlo experiment to know for certain whether they are significant or simply “ordinary.” I would like to stress that the Codes research is not a cult or a religion, but a discovery made by rabbi Michael Dov Weissmandl back in the 50s, and carried into the modern age by professor Eliyahu Rips, Doron Witztum and Joav Rosenberg back in the 70s and 80s when computers finally became available. I have enormous respect for professor Rips, Rabbi Glazerson, Dr. Alex Rotenberg, Art Levitt, and my long-time friend Prof. Robert Haralick. All brilliant genius-level and dedicated men trying to understand the 3-dimensional mystery of the Codes and Gematria. All of them feel we have a long way to go to fully understand them, but the fact is that they are real. The Codes do exist mathematically. How they are used is predicated on the correct use of the original Hebrew text, and the rabbis and professors have noted many tables in the past where correct Hebrew was not used, and hence the tables came up with incorrect information. And, there are sometimes more than one way to spell a name or a word in Hebrew. Rabbi Glazerson knows the way words were phrased in ancient Hebrew, which makes him invaluable for these searches. I will not attempt to search for Codes on my own since my job is to cover the phenomena as a filmmaker. The tables that I was showing on Skywatch, and will be showing in the month of April, were some of rabbi Glazerson’s latest discoveries which I thought were interesting. Several of them are about the Messiah. The year 5776 / 2016 came up repeatedly. We cannot and will not make predictions, only point out what the rabbis are finding. This is also not to confuse the Jewish beliefs of their Messiah with the Christian faith. All will become known in due time. This is not a contest, nor the time to divide and cast aspersions on the Judiac or Christian faiths. It is my belief that we all need to come together. As far as Glazerson “peddling” the DVDs, I would submit that he has probably given away more of them for free to other rabbis than he has ever sold. Perhaps Richard Ruff has never had to finance a real documentary himself and doesn’t realize the enormous expenses of production and post to do one at this level. Still, we have given away many DVDs and BluRay copies for all the right reasons. Raymond Elwood, “Lord RayEl’s” real name, is simply one of many self-proclaimed Messiahs that are misleading people all over the world. It is not surprising to us, since this type of thing was prophecised in scripture that it would indeed happen. What seems to now be happening, in their provocative Tweets about ISIS, is disturbing. — Richard Shaw, Director of TORAH CODES End to Darkness and the WATCHERS series. Thank you Richard. I’m so pleased that you have made contact with Glazerson and warned him about the threats. Regarding RayEl Raw Stories Editorial piece in 2014 is old hat, rather sloppy journalism to be honest. We have uncovered so much more, Raymond Lear Is bad news. The codes are interesting, and Richard Ruffs shocking abuse of them is disgusting. Jonathan Matthew Wright, another Torah Code researcher found a similar code on RayEL, to that which Rabbi Glazerson found. I just hope that they do not do something stupid (the clergy) that is, there are quite a few of unstable followers. Thank you again. Sometimes it’s good to just make everyone aware of the facts, and thanks for your efforts! Twiiggietruth, please contact me directly. Richard Shaw I’m so glad that you have commented to this. We have been watching this group for somewhere around 4 years and they have just gotten more and more radical as the months went by. We’ve fought them across social media the whole time trying to get the world to notice what was building in this doomsday cult. It seemed for so long to be fruitless. Nobody would take it serious. We’ve received threats, character assassination, and other forms of abuse due to our attempt to get the truth out there. I’ve myself tried several times to contact Tom Horn to pass on the info we’ve had but that was fruitless also. It was about 8 months ago I contacted his wife but she wasn’t very happy about it and refused to pass on the message. Now they are in Israel which is what I was trying to prevent happening from near the beginning. It’s all been a joke in people’s eyes until now. They are there with the mindset that they are in Jerusalem for a takeover. That is radical and terroristic. Again I am so glad that this is finally gaining notice after fighting this group for so long in the dark. We have cost them many members. Convinced them to get away from the influence and get on with their lives…with their families. So much time has been put into this for us. Years. Please realize that this is not just some internet scam. This group is dangerous and they gloat in the destruction of outsiders i.e. Armageddon where they are considering themselves the saved. There is no this possibly can’t happen in their minds. They are convinced and will do anything he asks them to do. That’s dangerous. A powder keg. Thank you brother. Thank you for taking notice. Our exposure is harming them, but not enough. They still managed to fund their trip. From what I can gather 6 from Mexico just arrived – all lied to Israeli immigration with respect to how long they are staying. This all funded by tithes. The accommodation alone for a month cost $16000 funded / secured by Tithes. It will be interesting to find out and push forward to see they are registered as a non-profit organisation. Donnon you have worked tirelessly with this group. Thank you. When this is deemed as a terrorist group I cannot imagine how many people are going to be picked up and questioned/interrogated for funding said terrorist organization thru these tithes. This is something every RayEl follower reading this needs to think about and understand. Working alongside Richard Shaw and L. A. Marzulli over the years I dare say they are some of the most honest, kind hearted and thoroughly erudite researchers I have ever known. They are also truly compassionate men of faith in Christ who simply understand they have been called to be watchman on the wall. (Ezekiel 33:6) Shaw and Marzulli are doing the job extremely well just as our friend’s Derek and Sharon Gilbert and the rest of the Skywatch TV team are doing. If anyone messes with any of Jesus/Yeshua’s friends you shall end up dealing with our Heavenly Father. Please consider what the Lord Jesus said here: John 15:15,” Henceforth I call you not servants; for the servant knoweth not what his lord doeth: but I have called you friends; for all things that I have heard of my Father I have made known unto you.